We have listed many of the most common questions researchers have about visiting our research room or working with the textual and audiovisual materials. Don't see what you're looking for here? See our Visit the Research Room page or contact us. What is the best way to begin my research? We advise all researchers to begin their research with published sources in order to be familiar with their topic. Since this is an archive, our holdings are maintained in their original order and are not organized by subject, as is the case with library holdings of books. You are encouraged to know important dates and names of White House staff members that would have been involved with your topic. This information is necessary because many of our collections are White House Staff Member and Office Files and/or are arranged chronologically. Review the Visit the Research Room resource for background information on the history of the materials, how the materials are organized, and what to expect when you visit our Research Room. View the Guide to Holdings to see if we have material on your topic. More detailed descriptions of the collections are available by request and in the Research Room. Contact us by emailing nixonreference@nara.gov or calling 714-983-9320. How can I find something specific on this website? How do I search the National Archives Catalog? In addition to using the search box on our website, you can also search the National Archives Catalog online. The National Archives Catalog is available from the National Archives and Records Administration (NARA). You can use it to search more than 2 million catalog records for materials located at NARA locations across the country. Use the instructions below to search for all Nixon-related materials and/or for specific Textual Materials, White House Tapes, and Audiovisual Materials. You can use the search function to locate catalog records for Nixon-related textual materials, the White House Tapes, and Audiovisual Materials. Additional tips on searching for White House Tapes and Audiovisual Materials are located further down this page. Enter your keyword or keywords to search the Catalog OR use the Advanced Search function to refine your search by search term, data source, name of a person or organization, or time period. 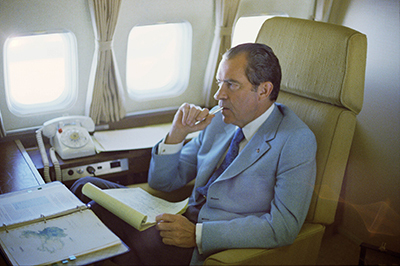 Descriptions of collections and digital images of select Nixon Presidential Library textual materials are available in the National Archives Catalog. Enter your query in the Search Term field. Under Refine By: Type of Materials, select Textual Records. Under Refine By: Location, select Richard Nixon Library. Follow this link to visit the National Archives Catalog record for the Nixon White House Tapes. Select Search within this series button next to the file units listed in the "Includes" detail. Enter your search in the "Search our catalog" box at the top of the page and click the Search button. A representative collection of digital images is available. Individual photo records are organized by film roll and frame number, for example: 3661-17, 1229-03, and so on. Records may be cited using this syntax. Follow this link to visit the National Archives Catalog record for the Nixon administration White House Photo Office series. Browse all digitized images or enter your search term into the search box following the "*-*" and click the Search button. Where is the Nixon Library located and why do I need to go there to review the materials? The Richard Nixon Presidential Library and Museum is in Yorba Linda, Orange County, California. Currently, very few original materials are available online, and we are not staffed to do substantive research. Must I make advance arrangements to use the Nixon materials? No. However, if you notify the staff of your upcoming research trip, we will be able to prepare in advance. Who may use the National Archives and Records Administration's (NARA) holdings? You must be at least 14 years old. Children under 14 can be admitted under limited circumstances and only with the prior approval of research room management. If you have questions, contact the manager of the NARA research room you plan to visit. For more information see Regulations for Using the National Archives. Is photocopying allowed at the Library? Can I bring and use cameras, scanners, and laptops? You may bring equipment. All bags and carrying cases must be left in lockers outside of the Research Room. Flatbed scanners without sheet feeders are allowed. When you are using a scanner, you must show it to the research room staff and receive special instructions. Handheld "wand" type scanners are not allowed. Can I do research by mail? Are travel and research grants available? How should I cite material found at the Nixon Library? Type of document; names of sender and recipient, or title of document; date; folder title or White House Central File Code; box number; collection title; Richard Nixon Presidential Library and Museum, Yorba Linda, California. Memo; John Dean to President Nixon; 15 July 1972; folder Memoranda to the President, July 1972: Box 63; White House Special Files: Staff Member and Office Files: John Dean; Richard Nixon Presidential Library and Museum, Yorba Linda, California. Letter; President's meeting with Ambassador Smith; 22 March 1972; folder FO 3-1 Executive; Box 54; White House Central Files; Richard Nixon Presidential Library and Museum, Yorba Linda, California. Location of conversation, Conversation Number; Date; White House Tapes; Richard Nixon Presidential Library and Museum, Yorba Linda, California. OVAL 741-2; June 23, 1972; White House Tapes; Richard Nixon Presidential Library and Museum, Yorba Linda, California. Folder title. Box #. Campaign 1946. Richard Nixon Library and Birthplace Foundation, Yorba Linda, California. Folder Title. Box #. Post-presidential Correspondence with Ronald W. Reagan (1974-1993). Richard Nixon Library and Birthplace Foundation, Yorba Linda, California. Folder title. Box #. The H.R. Haldeman Collection. Richard Nixon Library and Birthplace Foundation, Yorba Linda, California. Folder Title. Box #. Series # (if applicable). Richard Nixon Pre-Presidential Materials (Laguna Niguel). Richard Nixon Presidential Library and Museum, Yorba Linda, California. National Archives and Records Administration. Can I request declassification of security classified material? Yes, researchers may request declassification of security classified materials. Each item must be clearly identified by the requester using the information from the Document Withdrawal sheets located in the files. Declassification requests should be submitted to the Nixon Staff for processing. Follow the Mandatory Review Request instructions. The National Archives and Records Administration acts as the facilitator of the review process; the declassification is done by the originating agencies or agencies with an interest in each document. Additional information about access to closed materials is available on this web site under Visit the Research Room. Document reproductions can be ordered at the current standard fee set by the National Archives. Citations for individual documents must be specific and correct. Our staff cannot select documents for you nor can we perform substantive research. If a specific document is not requested, reproductions of textual materials are made at the folder level. See our Get Copies webpage for more information. How does copyright law affect research? The copyright law of the United States, Title 17 United States Code, governs the making of electrostatic copies, photographic prints, and audio and video tape recordings of copyrighted material. Under certain conditions specified in the law, libraries and archives may furnish reproductions. One specified condition is that the reproduction of copyrighted material is not to be used for any purpose other than private study, scholarship, or research. If a user makes a request for, or later uses a reproduction for, purposes beyond those of "fair use", that user may be liable for copyright infringement. This institution reserves the right to refuse to accept a reproduction order if, in its judgment, fulfillment of the order would involve violation of copyright law. Neither the Nixon Library nor the National Archives has legal authority to rule on questions of copyright. The Library of Congress' Copyright Office will, for a fee, research the copyright status of audiovisual materials made available from the Nixon Library. Audiovisual Rights Statement in the Audiovisual Materials FAQs section on this page. May I reproduce other NARA records? In general, all government records are in the public domain and may be freely used. We do have some donated or other materials that might be subject to copyright restrictions. If you have questions about specific records, speak to an archivist or reference staff who handles those records. Are all the materials open to research? Most open collections have some items that are temporarily restricted from public use. Document Withdrawal Sheets in the collections identify these withdrawn items and mark their file locations. Most closed items are national security classified or closed pursuant to PRMPA and its implementing regulations. May I see items in "unprocessed/closed" collections? No. The Nixon Library will release only files it has archivally processed, preserved, arranged, described, reviewed for restricted information, and opened per the applicable laws and deeds of gift. How much assistance can the Nixon staff provide to researchers? We are not staffed to do substantive research, but we encourage you to contact us to discuss your topic. We suggest using this website to identify the topics you are interested in and either visit us or hire a researcher. Do you have President Nixon's resignation letter? No, the original letter is located with the Records of the State Department (Record Group 59) in the National Archives in College Park, Maryland. [See Also: General Records of the Department of State] The digital image of the resignation letter can be found on the Ford Watergate Files exhibit. Where will I find the most documents that President Nixon annotated or wrote? President Nixon frequently annotated the news summaries prepared for him with instructions to the staff, and he also noted his impressions of current news events. These files can be found in the Annotated News Series. Much of his original handwriting is in the President's Handwriting Series. Both of these series are in the White House Special Files: Staff Members and Office Files: President's Office Files. Do you have the letter I wrote to President Nixon? Possibly. Many of the letters from the public have been retained. Please contact us for more information. Do you have the letter from Elvis Presley to President? Yes, the original letter is in the holdings of the Richard Nixon Presidential Library and Museum. It is located in the White House Central Files: Subject Files: [EX] HE (Health): HE 5-1 Narcotics. In addition, the National Archives' When Nixon Met Elvis virtual exhibit contains downloadable photos and original documentation from the December 21, 1970 meeting. Where are Vice President Spiro Agnew's papers? The Papers of Vice President Spiro T. Agnew are located in the Archives and Manuscripts Department at the University of Maryland in College Park, Maryland. Please contact the department for more information at: 301-405-9058. Can I order copies of audiovisual materials from the Nixon Library? Yes, please visit our Get Copies page or contact us for information about ordering audiovisual materials. 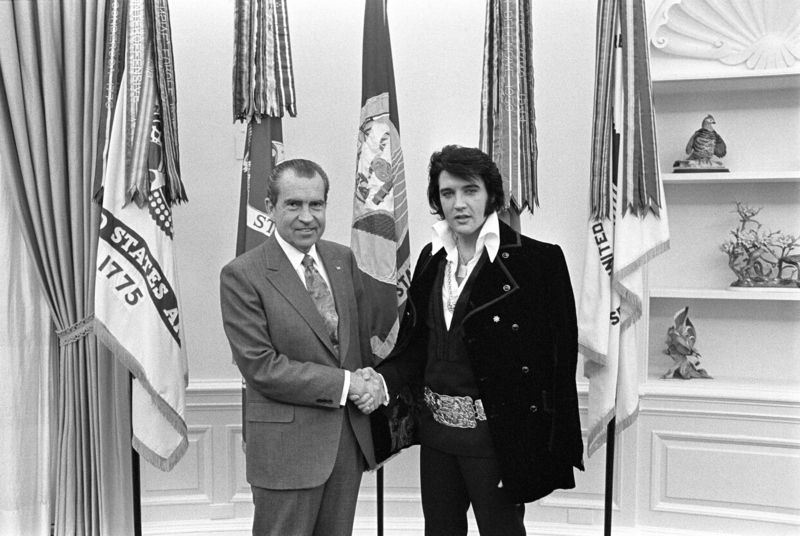 Do you have the original photographs of President Nixon shaking hands with Elvis Presley? Yes! The Richard Nixon Presidential Library and Museum has the original letter and the 28 black and white photographs of Elvis Presley meeting President Nixon taken by White House Chief Photographer Oliver F. Atkins (Elvis is pictured in all but one and shakes hands with Nixon in several). The When Nixon Met Elvis Exhibit on the National Archives archives.gov website contains downloadable photos and original documentation, including the letter, from the meeting. The meeting was captured by the White House Photo Office (WHPO) on film rolls 5364 and 5369. High resolution scans of all 28 frames from both film rolls are available for download. A ZIP File is available here. Roll/negative number 5364-18 is the photo that is usually requested (see thumbnail at left). A 600ppi JPEG scan is available here. The meeting is also depicted on the National Security Archive's web site. Do you hold any photographs of Richard Nixon with Martin Luther King, Jr.? the June 27, 1957 edition of JET Magazine contains one such photograph; a copy of this issue is held by the Nixon Library. Please contact us and cite "Textual Collection: PPS 320, Box 22, Folder 1, JET Magazine p.5" for further assistance from a textual archivist. Do you have any footage of the moon landing? We have actual footage of the Apollo Eleven Moon flight and landing and more. Can I obtain an official portrait of President Nixon, First Lady Pat Nixon, and/or the First Family? Please note that these and other photographic reproductions supplied to researchers are only available as digital copies. Digital copies are high enough resolution to allow researchers to make their own paper prints. Do you have photographs or motion picture footage showing the giving of moon rock (i.e. moon dust) gifts? The presentation of moon rock gifts to state governors on December 3, 1969 was captured by the White House Photo Office (WHPO) on film rolls 2526, 2528, 2529, 2530, 2531, 2533, 2534, and 2535. White House Communications Agency (WHCA) sound recordings WHCA-SR-H-104, WHCA-SR-P-691203, WHCA-SR-P-691204 and WHCA-SR-P-691205 were also recorded at the same event. News summary tape WHCA-3583 contains network news broadcasts pertaining to the same event. The presentation of a moon rock gift to Philippine President Ferdinand Marcos was captured by the White House Photo Office (WHPO) on film roll 2764. A White House Communications Agency (WHCA) sound recording (WHCA-SR-B-034) was recorded at the same event. White House Photo Office (WHPO) film roll D0104 depicts a lunar rock sample presented to President Nixon. Additional White House Communications Agency (WHCA) sound recordings are available for the presentation of moon rock gifts to the Foreign Minister of Indonesia (WHCA-SR-B-50) and to the Prime Minister of Australia (WHCA-SR-B-053). Photographs of Parker pens containing lunar dust (PAR.17.3.1&2) given by President Nixon to Chinese officials in 1972 are available. Where can I find the video of Nixon's 1969 Inaguration? The list of Frequently Requested Audiovisual Materials in the Guide to Holdings includes the Nixon Inauguration and other landmark events. Do you have a collection of Watergate-related photographs available? Yes, a collection of low resolution images from the White House Photo Office is available as a zip file. Additional photograph collections related to Watergate (National Archives ID 518203) and the Watergate Complex (National Archives ID 304965) are available through the National Archives Catalog. Do you have any photographs or footage of President Nixon signing Title IX ("The Education Act")? While we do not have any photographs or motion picture footage depicting the signing, there are some limited, related resources available. The Presidential Daily Diary notes that in June 1972, President Nixon recorded a short segment on the passing of the Act for the media. A one-minute, sound-only segment is available (WHCA-SR P-720610) as well as recorded network news broadcasts on June 23, 1972 (WHCA-5511) that indirectly refer to the passing of the Act. However, the emphasis of the pre-recorded Presidential comments is on the President's opposition to busing; the Act's pertinence to women's rights is not mentioned. Beyond the Nixon Library, NBC Universal Archives contains an item which claims to show President Nixon signing the Act. However, footage from this production depicting a signing ceremony is likely generic stock footage due to President Nixon's opposition to busing. Do you a photo of President Nixon signing the 1973 Endangered Species Act (ESA)? We do have photographs of President Nixon signing the Endangered Species Conservation Act (P. L. 91–135) on December 5, 1969, witnessed by Secretary of the Interior Walter J. Hickel. The photographs were taken by the White House Photo Office (WHPO) and are on roll #2555. No. Unfortunately, there is no film, audio, video or photographs in our holdings documenting President Nixon signing the Endangered Species Act (ESA) on December 28, 1973. A public statement was issued from the Western White House in San Clemente, California. It is published online at the American Presidency Project HERE. HISTORICAL NOTE: The Endangered Species Conservation Act was an amendment to the 1966 Endangered Species Preservation Act of 1966 (P.L. 89-669). 1973’s Endangered Species Act was a completely rewritten Act incorporating and expanding on features of the ESCA and the ESPA. WARNING NOTE: An image published online on various websites is incorrectly described as President Nixon signing the ESA. This image shows the Executive Order HR 6269 signing May 28, 1969. HR 6269 permitted commemorative medals to be struck celebrating the 300th anniversary of South Carolina’s founding. How can I locate images of President Nixon with his arms in the air or making victory signs? Many images are available. 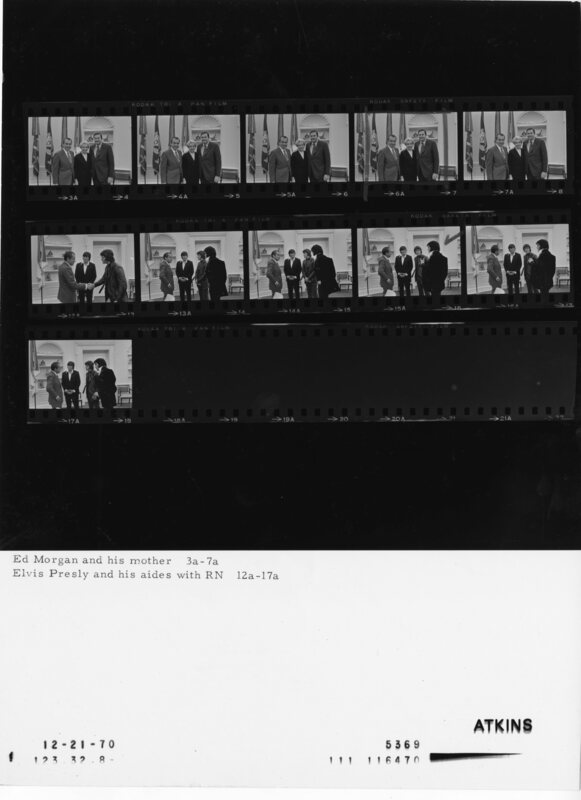 For convenience we have compiled a contact sheet showing representative images of President Nixon. Please reference the catalog numbers listed below each frame when ordering reproductions or inquiring about them. I am doing research on the Okinawa Reversion Agreement of 1971. Do any of the White House Tapes contain conversations pertaining to the Senkaku (Diaoyu/Diaoyutai) Islands? Yes. The following White House Tapes conversations refer directly to the Senkaku (Diaoyu/Diaoyutai) Islands: 513-1, 513-4. Additional keywords that are potentially relevant to this subject and may be used to search the White House Tapes subject logs include: textiles, Taiwan, Okinawa, reversion, Okinawa reversion, and Ryukyu. A searchable White House Tapes CD-ROM finding aid is available. Contact us for more information. You may also be interested in the Henry Kissinger Telephone Conversation transcriptions ("HAK Telcons") located in the Nixon Library's textual collections. The following telcons either refer directly, or may refer, to the Senkaku (Diaoyu/Diaoyutai) Islands. Memorandum of Telephone Conversation between Kissinger and Under Secretary Johnson re: Post story on reaching an agreement regarding Taiwan; 6/7/1971; folder: Telephone Conversations - Chron File, 1971, 1-7 June (5 of 11), [2 of 2]; Box 10; Henry A. Kissinger Telephone Conversation Trascripts (Telcons), Chronological File. Memorandum of Telephone Conversation between Kissinger and Under Secretary Johnson re: ongoing islands negotiations; 6/8/1971; folder: Telephone Conversations - Chron File, 1971, 8-12 June (6 of 11), [1 of 2]; Box 10; Henry A. Kissinger Telephone Conversation Transcripts (Telcons), Chronological File. Memorandum of Telephone Conversation between Kissinger and Under Secretary Johnson re: ongoing negotiations between Japan and Taiwan on disputed islands; 6/8/1971; folder: Telephone Conversations - Chron File, 1971, 8-12 June (6 of 11), [1 of 2]; Box 10; Henry A. Kissinger Telephone Conversation Transcripts (Telcons), Chronological File. Memorandum of Telephone Conversation between Kissinger and Under Secretary Johnson re: ongoing negotiations between Japan and Taiwan on disputed islands; 6/9/1971; folder: Telephone Conversations - Chron File, 1971, 8-12 June (6 of 11), [2 of 2]; Box 10; Henry A. Kissinger Telephone Conversation Transcripts (Telcons), Chronological File. What are the copyright restrictions of the audiovisual materials? The copyright law of the United States, Title 17 U.S.C., governs the making of electrostatic copies, photographic prints, and audio/video tape recordings of copyrighted material. Under certain conditions specified in the law, libraries and archives may furnish reproductions. One specified condition is that the reproduction of copyrighted material is not to "used for any purpose other than private study, scholarship, or research." If a user makes a request for or later uses a reproduction for purposes beyond those of "fair use," that user may be liable for copyright infringement. This institution reserves the right to refuse to accept a reproduction order if, in its judgment, fulfillment of the order would involve violation of copyright law. The U.S. Government exercises no intellectual property claims on materials created by or for its offices (17 U.S.C 105), therefore the exclusive work products of government organizations and its employees or agents are non-copyrightable. Some Federal work products however contain compiled content created by third parties that may be subject to copyright or other forms of restrictions; Federal work products may also contain personal likenesses subject to publicity rights restrictions. Those desiring to reproduce materials bear the responsibility of making individualized determinations as to whether intellectual property rights are implicated by the nature of the materials and how they may wish to use such materials. The National Archives and the Nixon Presidential Library and Museum do not have legal authority to rule on questions of copyright. The Library of Congress Copyright Office will, for a fee, undertake to research the copyright status of audiovisual materials made available from the Nixon Presidential Library and Museum and the National Archives. While copyright is a federally protected right under copyright law, privacy and publicity rights are the subject of state laws. While many states have privacy and/or publicity laws, others do not recognize such rights or recognize such rights under other state laws or common law legal theories such as misappropriation and false representation. Those desiring to reproduce materials bear the responsibility of making individualized determinations as to whether privacy and publicity rights are implicated by the nature of the materials and how they may wish to use such materials. The Nixon Presidential Library and Museum and the National Archives and Records Administration exercise no intellectual property claims on the materials in its holdings and cannot grant exclusive rights for the use of materials in its holdings. In addition to U.S. Government works, the Nixon Presidential Library and Museum also has material in its holdings not created by the Federal government which may be subject to copyright, donor, or other forms of restrictions. Please email Nixon Library audiovisual staff if you have questions concerning the provenance of non-government created records. While not all records have such information attached to them, such information may assist those wishing to pursue researching the rights status of a given record. During what time period was the Nixon taping system in operation? The taping system was installed in the Cabinet Room and the Oval Office on February 16, 1971. The History of the White House Tapes provides details about when the system was expanded and removed. How can I find Watergate-related conversations that may be of interest to me? Visit the White House Tapes section of this website. The tapes are organized in several segments. Descriptive information and transcripts are available for the 12 and a half hours hours of excerpted Nixon White House tape conversations that were played in open court during the Watergate trials. These descriptions include date, location, participants, exhibit number, abstract, and cassette number. These tape segments include "Smoking Gun", "Cancer on the Presidency", and the "Dean Resignation"conversations. Descriptive information and transcripts are available for the 60 hours of excerpted Nixon White House tape conversations that were subpoenaed by the Watergate Special Prosecution Force. These descriptions include date, location, participants, and cassette number. These Tape Subject Logs include AOGP conversations from February 1971 to July 1973. Where are the "Smoking Gun," the "Cancer on the Presidency," and the "Dean Resignation" on the tapes? Visit the Watergate Trial Tapes section of this web site. The "Smoking Gun" conversation is on Reference Cassette # E-2 and online. The "Cancer on the Presidency" conversation is on Reference Cassette #'s E-7, E-8 and E-9 and online. The "Dean Resignation" conversation occurs on Reference Cassette # E-20 and online. How accurate are the transcripts for the Watergate Trial Tapes and the WSPF tapes? The National Archives neither created nor corrected the transcripts and does not vouch for their accuracy. Variations in sound quality and in the hearing of listeners can produce different interpretations of what is heard. While transcripts may be prepared with great care and substantial effort, many points of ambiguity are inevitable. Erroneous interpretations from transcripts are always possible. To ensure full confidence in quotations from the Presidential recordings, users are strongly urged to check all transcribed renditions against the actual tape recordings and judge for themselves what they hear. Every effort has been made to ensure that the electronic version is a faithful copy. How can I find Chronological or Cabinet Room conversations that may be of interest to me? The Nixon staff has prepared Tape Subject Logs (detailed subject outlines) and Finding Aids for the Chronological and Cabinet Room Complete Conversations. To download the CD-ROM contents (including a Searchable Index, Logs and/or Transcripts, and Scope and Content Notes), click here. To download, right click on link and select "Save Link" or "Save Target" to your computer. Extracting the files requires file extraction software, such as StuffIt or WinZip, that can "unzip" (open) the compressed zip file, once it is completely downloaded on your computer. The file is 157 MB. Is there a recording of the meeting between President Nixon and Elvis Presley? No. Richard Nixon met with Elvis Presley in the Oval Office in December 1970. The White House taping system was not installed by Nixon until February 1971. The When Nixon Met Elvis online exhibit provides a behind-the-scenes story of the famous 1970 meeting as told through original letters, memorandums, and photographs. Are there copyright restrictions on the Nixon White House Tapes? The Nixon White House Tapes are in the public domain and are not subject to copyright restrictions. For more information on U.S. Copyright Law visit Copyright Law of the United States.